Halloween is literally 2 days away and if you haven’t been able to go out this weekend to enjoy a party, not “trick” but treat yourself to some spooky cocktails to enjoy with friends. I am not here to tell you how to put together a Halloween party but offer you some oozy, boozy Halloween inspired cocktails to delight you and your guests. Here is a compilation of five bewitching, easy to make drinks in celebration of a spooktacular night. What is Halloween without the pumpkin? When was the last time you have tried a cocktail with entailed pumpkin? Well, not most of us. In a large skillet, heat the oil. Add the cinnamon sticks and star anise and cook over moderate heat until fragrant, 2 to 3 minutes. Add the pumpkin, season with salt and cook, stirring occasionally, until the pumpkin is lightly browned and starting to soften, 10 minutes. Add the milk and simmer until the pumpkin is very soft and the milk has thickened slightly 10 minutes. Remove the skillet from the heat and let cool briefly; discard the spices. In a blender, puree the pumpkin, milk and 1/2 teaspoon of salt until smooth. Transfer the blender to the refrigerator and chill until the pumpkin puree is cold, 30 minutes. Be careful to never toil with a witch’s heart because she just haunt your happy hour. Nothing like a good ol‘ bloody drink with fresh fruit and blackberry soda, delightfully refreshing and festive. Start by adding the spiced rum, Fernet, and crème de cacao to your shaker. Next, add the squid ink. Careful, this stuff stains! Give the ingredients a hard, dry shake (no ice). This will help thoroughly incorporate the ink. Fill your shaker with ice and shake vigorously for a full 30 seconds so that your drink becomes cold and frothy. Double strain into a chilled cocktail glass and top with the chocolate stout. Have you ever made a potion? 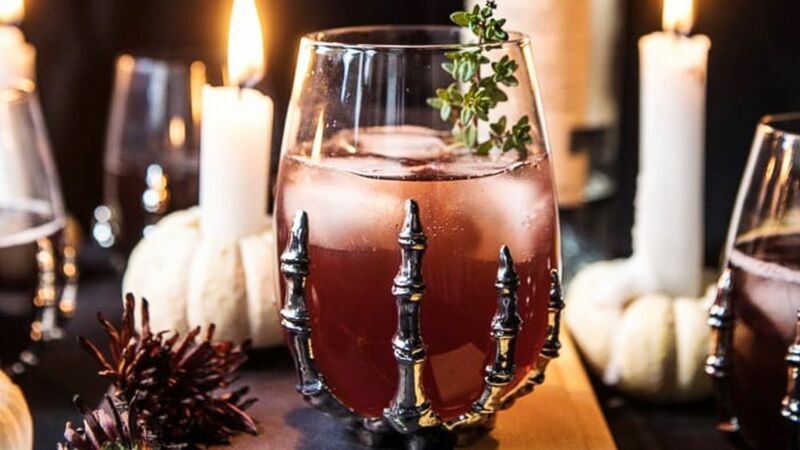 Here is your chance to make a tasty concoction while re-watching the classic “Hocus Pocus“. Mix pineapple juice, almond extract, coconut extract and food coloring in a small picture or large measuring cup. For each drink, pour 2 ounces pineapple juice mixture into beverage glass. Top with 4 ounces of sparkling white grape juice. How to Rim Glass with Orange-Tinted Sugar: Place 2 tablespoons sugar in the small resealable plastic bag. Add 5 drops McCormick® Red Food Color and 5 drops Yellow Food Coloring. Seal bag. Hopefully, you have seen the classic “Snow White” and learned never to take an apple from a stranger. In this case, go for it. I hope this helps with to make your celebration a spooktacular one. What spooky cocktail will you try this Halloween?